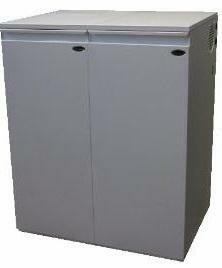 The Mega Combi CMC7 Plus is a condensing oil boiler which has been designed and manufactured by Mistral. This highly reliable boiler has a high efficiency rating of 90% making it A rated. This model has an output rating of 58-68kW making the boiler perfectly suited for larger homes with multiple bathrooms and a higher demand for heating and hot water. This boiler is also available as a non condensing model, in a range of outputs and as either an indoor or outdoor boiler. It has been finished in a double width high quality white casing and is supplied in two parts for easy handling. This should make installation quicker and easier which could save you money. As a Combi boiler it will supply hot water and heating on demand by using the mains water supply. This means you don't need to have bulky tanks or a storage cylinder. The multi directional flue outlet option allows a quick installation that can save you time and money when used together with pre punched pipe entry points on both the sides and back. It has a removable front casing the permits easy access for commissioning and future servicing. This boiler is backed by a 5 year Mistral guarantee of quality and provides practical heating and domestic hot water facility for larger homes.